Want to use your iPhone(s aapl) for tracking more than just your run? 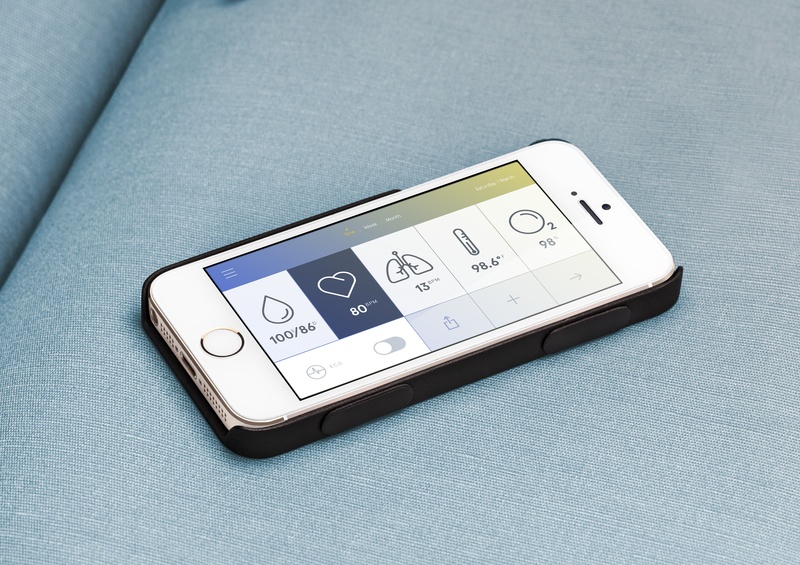 Azoi just launched Wello, a new mobile health tracker that can read and log a number of different vital signs. “We have effectively put health monitoring equipment, which typically sits on carts in doctor’s offices and hospitals, into a highly convenient and accessible mobile case,” said Hamish Patel, founder and CEO of Azoi. 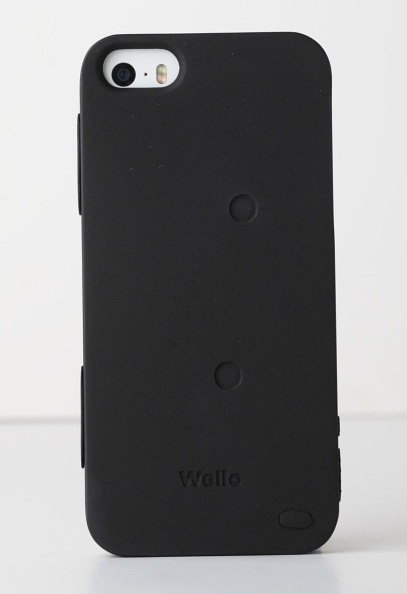 When you look at it, you’d be hard pressed to see Wello as anything other than a standard iPhone case. It’s a fairly innocuous black plastic cover that slides onto your phone and provides protection, just like any other case would. The difference is that Wello has a small chip embedded inside, and two sensors on the back. When you hold your fingers over the sensors for a few seconds, they can read a number of your vital signs including blood oxygen level, blood pressure, electrocardiography (ECG), heart rate, respiration and temperature. Wello can even read lung functions with an included spirometer attachment. The case connects to your iPhone via Bluetooth 4.0. The information it reads is sent to your device and presented in a companion app meant to highlight patterns over time. It will also connect with other health and fitness devices, starting with Fitbit trackers via Fitbit’s open API, to help identify how your regular activity levels impact your results. If used daily, Wello’s rechargeable battery should last up to two months, which is a lot longer than you’ll get from the average wearable activity tracker. It uses a proprietary port and charger which Azoi claims allowed it to make the case smaller than if it used microUSB. Though the initial device will be made to fit the iPhone 5 or iPhone 5s, the case itself uses Bluetooth, so it can theoretically sync with other iOS devices as long as they have the Wello app downloaded. Azoi is looking into an Android version as well, and is working on agreements with case companies to manufacturer cases with room for Wello’s chip to sit in. Wello is available for pre-order now in a number of countries. It is expected to retail for $199 in the U.S. and will ship in the fall pending FDA approval. I’m curious to get my hands on one and see just how accurate its measurements compare to other health trackers, like the Basis B1. I like the idea of a health tracker that fits on your phone, since you’re likely to have it on you, but you don’t have to wear it. Samsung just introduced a heart rate monitor in the Galaxy S5, though it can’t measure many of the other vitals that Wello does. Between the new M7 motion coprocessor in the iPhone 5s and the health tracking capabilities of Wello, it could turn your smartphone into a full-on health and fitness device. If you really think that pulse arrival time (which is what this device is measuring (maybe)) can give you an accurate blood pressure, you are wrong! This case is all hype and no proof. Mobile Health has a plethora of these types of devices without the clinical proof they need to be accepted. Good Luck with the FDA. Ask Sotera, who has differential pulse arrival time with intermittent cuff calibration, how easy it was. David, you are my hero!… I’m friends with many scientists in the space, and they call B.S. on everything Wello says they can do except Heart Rate and HRV (which they can only measure after several seconds of holding the case). And they have mounds of clinical data to prove it. I wish these west-coast buzz sites (like GagaOM, Techcrunch, Engadget, etc.) would kindly ask these companies for validation data before generating false buzz: think Amiigo and Airo, which generated international buzz only to be proven as a hoax. This space really needs “real” reporting to help consumers find “real” products that have a snowball’s chance of meeting their claims in the next 5 years.